Ready to put uniform and included in the Bulls 12 for the 3rd game against Miami is rumored to be Derrick Rose, who is closer than ever to return. Seems to have gone an entire ... eternity since the last time that Derrick Rose played basketball. 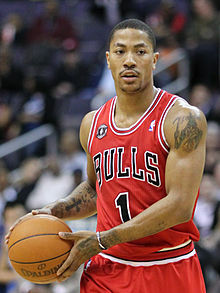 But the potential to see him in the third match of the series with Miami, now seems more likely than ever, as all the information coming from the other side of the Atlantic want Rose to be wearing for the first time his form and be included in the 12 the Bulls in the game Friday. play (this is ... theme Thibodeau), but all show that the young superstar the Bulls will probably return this year and not next year. Such reversals, of course, the longer we are used to so long (very long) case of the return of Rose. The conditions, however, are ideal for the comeback, with the Chicago come from the heaviest defeat in the history of the postseason and looks for the "two in two" at the United Center and preceded by 3-1 in the series. Ανώνυμος 9 Μαΐου 2013 - 5:51 π.μ.